There’s nothing like the fear of having a sick child and not knowing what’s wrong — except maybe if your child is ailing on a ship off the coast of Alaska, hundreds of miles from the nearest onshore medical help. Consumerist reader Dan wrote in to share a very scary experience that could’ve turned out a lot worse, if not for the kind crew of the Disney Wonder. Dan, his wife Gwen and their two kids — a 1-year-old son and 5-year-old daughter — had embarked on a weeklong trip up the Alaskan coastline on the Disney Wonder in early August, and were having a great time. But two days into the trip, they noticed that their son was getting worse and worse with what they thought was a cold. Finally he was so ill they took him to see the medical staff on board. “It was an extremely scary scenario – we had never been further from home and our son was clearly suffering with his condition worsening without a diagnosis, leaving his outlook uncertain,” writes Dan. While he points out that sometimes a cruise line will help sick passengers to shore and then leave them to their own devices, that wasn’t the case in this situation. 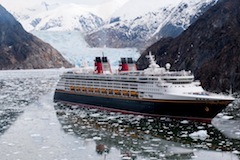 “Given our remote location and dire circumstances, the captain of the Disney Wonder himself visited us in the medical center with his kind condolences and informed us of his plan to sail to Juneau immediately at full speed, as that was our best option in getting our son care as quickly as possible,” explains Dan. The ship arrived in Juneau a full seven hours ahead of the trip itinerary, Dan says, all so his son could receive treatment as fast as possible. After a few hours at the hospital there, he was airlifted to Seattle and was diagnosed with pneumonia. Dan writes that he also underwent a successful operation to remove an object lodged in his lung and drain out the infection that had caused the lung to collapse. While the family spent time in Seattle during their son’s recovery, Dan says the Disney staff followed up several times to see if they could help with lodgings or making sure their luggage was forwarded to them. Disney also offered the family a credit toward a future trip, seeing as this trip didn’t end so great. But all of that pales in comparison to their son on his way to being healthy again, with the help of all the medical services involved and Disney Cruises, Dan says.